We recently came across some interesting hair growth research from Japan. This study explains the best way to stimulate hair growth for those who are suffering from different types of hair loss. 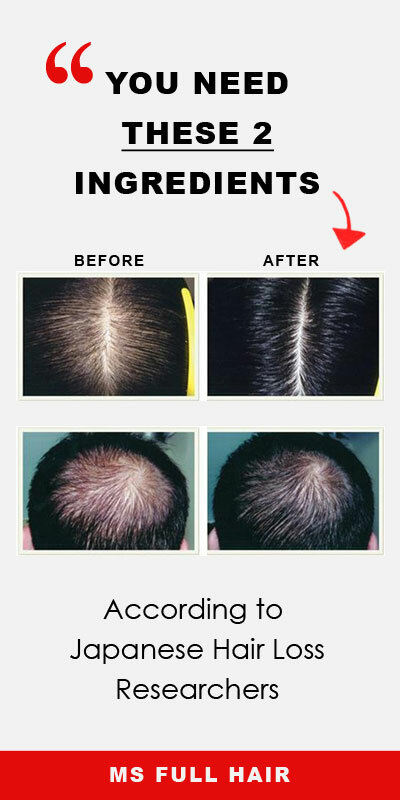 In addition, the author shares remarkable before and after improvements of people with thinning hair in the study itself as well as a bunch of more photos in another site (1). Looking at before and after photo comparisons, you can definitely see the researchers are onto something GOOD and that actually works, whether hair thinning was from the crown area of head, the frontal regions or even the widening central parts. In this article, we will share their research findings and give you a summary of actions you can take to grow your hair back, based on these findings. A 2007 study lead by Dr. Okajima talks about the importance of IGF-1 when it comes to hair growth. IGF-1 (Insulin-like growth factor 1) is a hormone that has a similar molecule structure to insulin. IGF-1 is primarily produced in the liver via growth hormone which is initially secreted by the pituitary gland. So, IGF-1 is like an extension of the growth hormone and plays a crucial role in encouraging cell growth for normal human development. A number of studies including this research indicate that IGF-1 also affects various aspects of hair growth from development and proliferation of hair follicles to regulation of hair growth cycle. Also, another study (2) proves the importance of IGF-1 for hair growth. This study observed that people with Laron syndrome (major deficiency of IGF-1) were showing alopecia symptoms. From frontal region recession to sparse hair growth, the study shows how IGF-1 deficiency can negatively affect proper hair growth. Interestingly, another study shows the relationship between IGF-1 and DHT. DHT is a hormone that causes hair loss in both men and women. In other words, people with balding tend to have higher DHT levels in the scalp. The researchers (3) note that DHT appears to inhibit IGF-1 production in the dermal levels. When DHT was administered into mice, the researchers observed the decreased dermal levels of IGF-1 as well as the decrease in hair follicle proliferation and the rate of hair regrowth. So how can you increase IGF-1 production in hair follicles? His answer: By stimulating sensory neurons. Capsaicin is an active compound in chili peppers. The spicier the pepper, more capsaicin the pepper contains, thus providing a stronger effect on sensory neuron. The research notes that both capsaicin and isoflavone release CGRP (calcitonin gene related peptide) from sensory neurons. 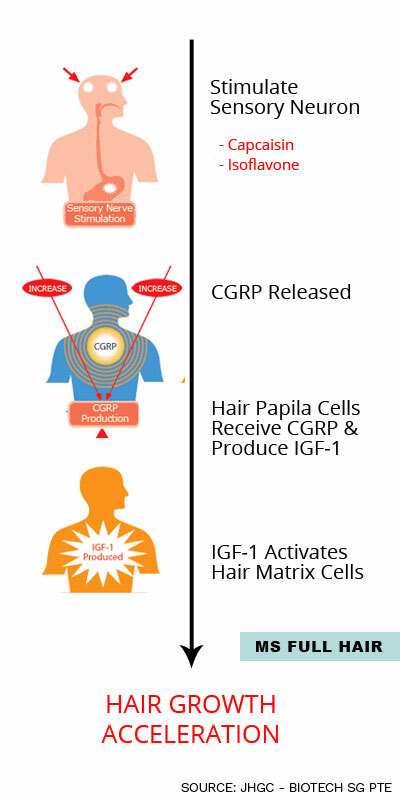 The increased level of CGRP then upregulates the production of IGF-1 hormone, thus stimulating hair growth. In other words, the researchers are saying that capsaicin and isoflavone induce hair growth by increasing IGF-1 production through CGRP. The researchers tested this theory on both mice and humans (4). They observed that a mice group that was given capsaicin and isoflavone via subcutaneous administration (aka injection) had significantly higher IGF-1 than a capsaicin-alone group in dermal levels. Also, more hair regrowth was shown in the mice group with the combination of capsaicin and isoflavone than the capsaicin alone group. The human study also showed significant results. 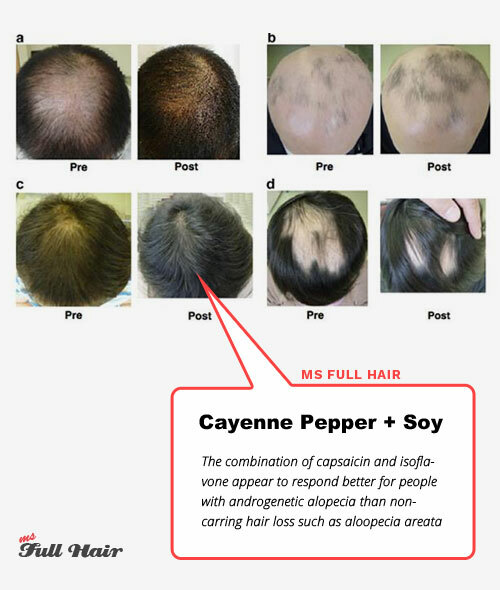 20 out of 31 alopecia participants showed visible hair regrowth after 5 months of consuming of 6 mg of capsaicin and 75 mg of isoflavone per day. Most importantly, about 90% of the participants with androgenetic alopecia showed impressive hair growth. This indicates that the combination of capsaicin and isoflavone works better for pattern-type hair loss than non-scarring hair loss (such as alopecia areata). As you can see from the above photo, the combined treatment wasn’t able to induce FULL hair growth on alopecia areata and alopecia totalis participants. In addition to the study, Dr. Okajima also shares a couple of different protocols for sensory nerve stimulation to induce hair growth. The first one is scalp massaging, in which may not surprise you too much. An intense scalp massage can be seen as a form of pain (temporarily). According to Dr. Okajima, you can stimulate the sensory nerves through pain and heat sensation. Another way he suggests is blue LED light therapy (this is probably the heat sensation part). The author doesn’t explain why blue light works better than any other types of phototherapies for hair growth. But some research shows that LLLT and excimer light have positive effects in inducing hair regrowth on people with alopecia areata. The participants were instructed to take 6 mg of capsaicin and 75 mg of isoflavone per day internally for 5 months. The amount of isoflavone content varies depending on which data you are looking at. The above data is from USDA Food Composition Database and Oregan State University. According to an article from Department of Chemistry at King Saud University, cayenne pepper contains 1.32 mg of capsaicin per g (dry weight). So, you will need take about 8 mg (7.92 mg to be exact) of dried cayenne pepper in order to get 6 mg of capsaicin content per day. In general, capsicum fruit (aka various types of peppers – such as cayenne and chili peppers) contains from 2.19 to 19.73 mg/g of capsaicin (dry weight). If you are looking for a more direct and convenient version, consider supplements that contain isoflavone and capsaicin. Take consistently for 5 months to see results (just like the Japenese research). There are a couple of interesting things about the study. First, while it’s nothing new about capsaicin (a main compound of red peppers such as cayenne pepper) for its hair growth stimulating property, the study shows that capsaicin creates a synergistic effect when it’s combined with isoflavone. They work as a team to increase dermal IGF-1 levels, which then induces new hair growth. Second, now when you do scalp massaging the next time, you know that you are both directly and indirectly increasing the dermal IGF-1 production! 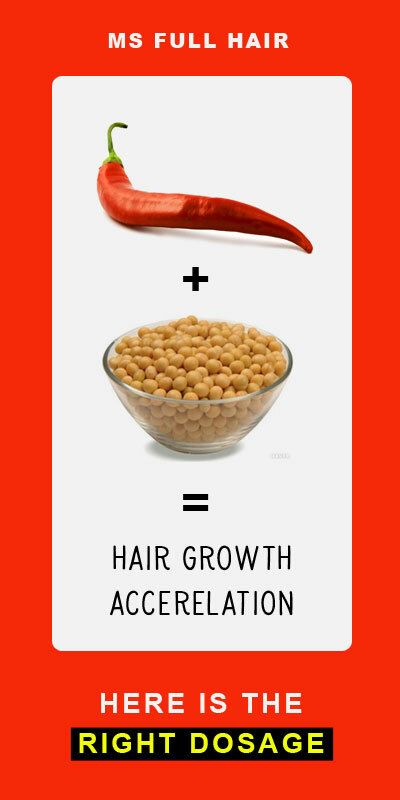 Have you cayenne pepper for hair growth? Share your experience in the comment!